Imagine owning a piece of the next game-changing business venture or being able to invest in what might be the next Facebook of the future generation. Some companies in Australia that have raised capital so far via OnMarket include a solar-focused energy retailer that became the world's most popular equity crowdfunding deal by investors (DC Power Co.) and a company that developed an innovative, caffeine energy mouthstrip that became Australia's first equity crowdfunding deal closed (Revvies). One can invest as little as $50 in the hope that the value of a company will increase as the company grows in the future. The only limit to investing is the $10,000 cap per company per year for retail investors (sophisticated investors have no limit). Investors also enjoy a 5-day cooling off period after their investment in case they change their mind. Investors should diversify their investment between different companies to minimise their risk, since investing in early-stage businesses is a high risk venture. Equity Crowdfunding is a long-term illiquid investment, so returns are gained if a company ‘exits’ through a trade sale, IPO or share buyback. It has been said that a bank is a place that will lend you money if you can prove that you don’t need it. As such, Australian businesses usually face a lengthy and difficult process when they try to get funds from banks. 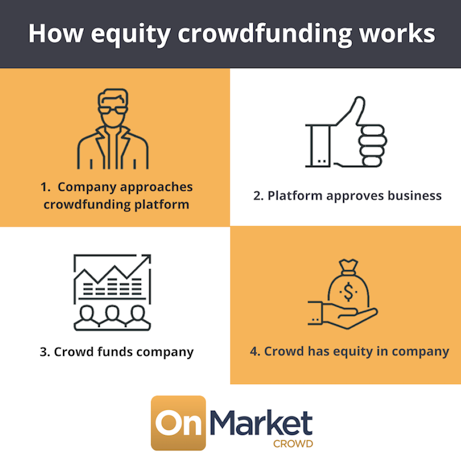 Equity Crowdfunding opens up a new way to access funds easily, gain awareness amongst a large number of consumers, and gain proof that people believe in their product offering. Nevertheless, the benefits and interest in Equity Crowdfunding is large – until recently, Australian businesses and investors have missed out on this innovative type of capital raising over the past few years as we have watched the booming Equity Crowdfunding market in the UK and USA take off. The Australian government has thankfully since caught up with the required legislative changes and OnMarket became one of the first in Australia to receive an equity crowdfunding licence. So join OnMarket and invest in businesses making an impact or visit OnMarket Crowd for more information.